It's likely that the dads you serve have many issues to address in their lives to become more stable, productive, and involved fathers. But often times, dads think they need to do something "big" to connect with their children, when most of the time, it's the little things that add up. And, as we always say, children spell love T-I-M-E. Think about the interactions you have with fathers. Do you give them small steps or ideas they can use to connect with their children daily? In this post, I'll share 7 easy things you can share with dads to help them connect with their kids, along with a unique, free resource that helps dads connect with their children by sharing their "favorite things". Enjoying a family meal together is one of the best ways to connect as a family. It’s an opportunity to discuss the highs and lows of the day and talk in detail about what you’re children are learning each day. Even if dad doesn't live with his children, he can try to find time once a week to have dinner with them. It may take coordination and effort, but it's worth it in the long run. If dads have young children, encourage them to read to them. Dad can use deep voices for some characters and high voices for others. Encourage dad to be animated! Reading allows for bonding with children like nothing else. For older children: suggest that dad read the same books his children are interested in. This will take extra effort, but at least take time to discuss the latest book they’re reading. He can ask good questions about the books and characters like, "Which character in the book is your favorite? Why?" The point is to connect with his child on a deeper level than asking “how was your day?” Then they answer, “Good.” And then the talk ends. Encourage dads to do something with his children that they enjoys. Let them pick the "thing". Whether it’s getting on the floor and playing with dolls or trucks, encourage dads to get on his child’s level and play. This simple thing will reap massive rewards and open lines of communications for later. For older child: do something they like, such as playing their favorite video game or walking around the mall – be invested and interested in your child intentionally for this activity. Whether dads have sons or daughters, encourage him to take time to go out for ice cream, go bowling, have a picnic at the park, etc. Dad picks the activity on this one. The point is for him to spend individual time with each of his children. Engage your children to participate in physical activity, and if he can, dad should initiate it! It will bond dads with kids and helps to build healthy habits. From riding a bike, basketball, or walking in a nearby park, dads can be intentional about getting out from the normal routine and get active this week. This may be as simple as coloring together if dad has young children or involving his child in fixing something around the house. Consider cooking together for this activity. From the trip to the store to preparation, dad can use the time to connect with his child and talk about life while doing something you have to do anyway. Family game nights haven't died. If it's possible, have dad suggest a family game night instead of going out to the movies. The idea is to have group interation, which generates playful conversation, fun, and bonding time. At NFI, we know that children whose fathers are involved in even the littlest things in life are better off on almost every cognitive, social and emotional level when measured by social science researchers. 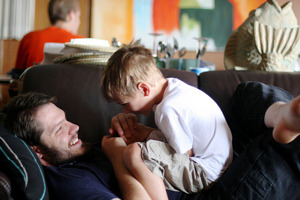 Help the dads you serve understand that even the littlest things count for his kids.